If you are new to knitting you may not be familiar with all of the knitting accessories that are available to make your knitting life easier and more productive! Let the tools do the thinking so you can focus on knitting!! At a minimum to start knitting, you'll need yarn and needles! Encore or Cascade 220 worsted or chunky weight yarn. 1 skein, NOT black! (or overly variegated). 1 skein is about 100g, 200 yards. You can make a gauge swatch and a hat in my beginner's course! US size 8 or 9 straight or circular needles. If you are planning on knitting a flat hat (free pattern here!) then get straight needles. Otherwise, if you are planning on learning how to knit in the round, get a set of circular 16" US size 8 or 9 needles and a set of 5 double pointed needles US size 8 or 9 (approx 7 inches in length). I highly recommend buying bamboo or driftwood needles as opposed to metal, since they are less slippery and that's better for new knitters. Stitch markers really help take the counting out of knitting. Set them every 10 stitches while casting on to keep track. Or set them between pattern repeats. I recommend starting with the "closed" loop type, though the open loop have their purposes on certain projects. 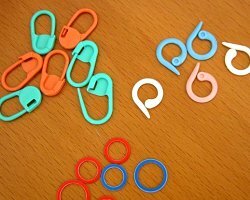 Once you get used to the concept of the stitch marker, you can buy some very cute and fancy ones! Row counters are one of the best tools. They come in all sorts of varieties - clicky ones, turning ones, digital ones, iPhone apps! But one thing is for sure, this is one of those necessary tools that makes your knitting life easier. I highly recommend keeping track of what row you are on by setting your row counter to that row. That way if you stop in the middle, you'll still know what row you are on when you pick up your stitches to knit again. There are types that fit on your straight needles, as well as those that fit onto circular needles. Pick the kind that best suits your project! A yarn needle is a pretty essential tool for all knitters. You'll usually need this to weave in your ends, but it comes in handy on almost every project. Measuring gauge becomes more and more important as you continue to knit things that require fit - i.e. sweaters and hats. With scarves you can often get away without measuring gauge. But anything that you want to match the size of a pattern, will require knitting a gauge. (See here for how to knit a gauge!). Additionally, once you start to acquire more and more knitting needles, you might need this ruler to determine what size all of those needles you own are! Whether you are going to travel with your knitting or not, it helps to have a small pair of scissors in your knitting kit. I personally LOVE my pair that folds up so there are no pointy edges at all. These are GREAT for air-travel! And also so they don't stab thru any bag that you put them in. Point protectors are a great knitting accessory. Especially if you want to be able to quickly put down your projects and store them. Point protectors make sure that your project won't slip off the needles. I still recommend pushing the yarn down onto your needles, but if you are using double-pointed needles, you can use these for the needles that you are not actively knitting on! If you are venturing into the world of cable knitting (woohoo! 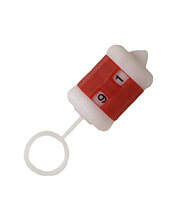 ), then the cable needle is your essential tool. There are a couple of varieties. A straighter version, with a small bump in the middle, or the type that is more of a hook. Try both and see which you prefer! The rule of thumb is that you will slip stitches onto the short end of the needle, and then knit off the longer end. You can also use a spare double-pointed needle to hold your cable stitches! Stitch holders are a very necessary tool for many projects. Generally these come into play on sweater knitting, when you are keeping some stitches "live", while you continue to knit another section of the garment.